A Go Dodgers! horizontal crawl will be part of the show, a show that'll run every night a World Series game is on. 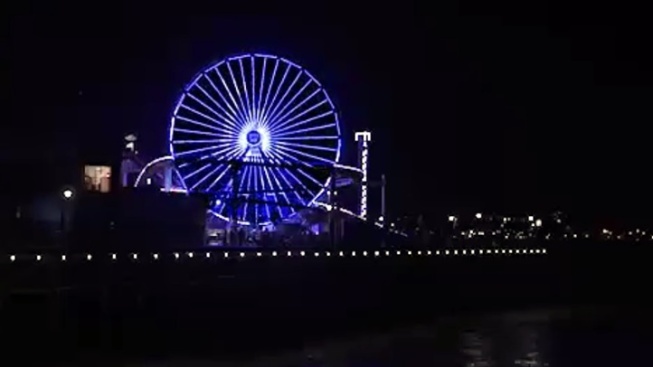 If it is a World Series game day from Oct. 24 through Nov. 1, 2017, the Santa Monica Pier Ferris wheel will be supporting the Dodgers with a blue-focused light display. Visit the famous Ferris wheel in person or see it online via its webcam. What's big, sparkly, blue, and white? Yes, the Pacific Ocean absolutely qualifies here, as it is quite large (fact) and very sparkly (when the sun is out) and highly blue (depending on cloud cover) and also white (when those ol' whitecaps start to form). Something else, though, that sits very near that wonderful, big, blue 'n white, and oh-so-sparkly stretch is about to take on some of those qualities, at least from Tuesday, Oct. 24 through Wednesday, Nov. 1, and at least on the nights when balls are flying and bats are swinging during the 2017 World Series. It's the Pacific Wheel we speak of, which is always large (though not as large as its wet neighbor, true) and sparkly after dark (thanks to 174,000 LED lights). The blue and white, though? It's all to pay towering tribute to the hometown team as they face off against the Houston Astros in Major League Baseball's much-anticipated Fall Classic, which opens at Dodger Stadium on Tuesday, Oct. 24. So what does the Santa Monica Pier's most prominent feature have in store for Blue buffs wanting to see a Dodgers-themed show on the side of the world's only solar-powered Ferris wheel? A Go Dodgers! horizontal crawl will be one of the fan-cool features, and the insignia of the team will also appear on the side of the ride, which stands at 130 feet above the ocean. Dodger blue will be a prominent hue, and white will be, too. Various icons associated with all the action on the diamond will pop up as well, lending some caramel popcorn charms and "hey batter" panache to the Pacific Park icon. The hours to see all of this Go Dodgers!-esque grandeur? The Pacific Wheel is putting in some extra innings on this home run of a show: It's on each night of the World Series from sunset, or around 6 p.m., to midnight. If you can't make it to Santa Monica, because you're at the stadium or watching a game from your den, check it out: There's a Live Cam feature on the Pacific Park web site.